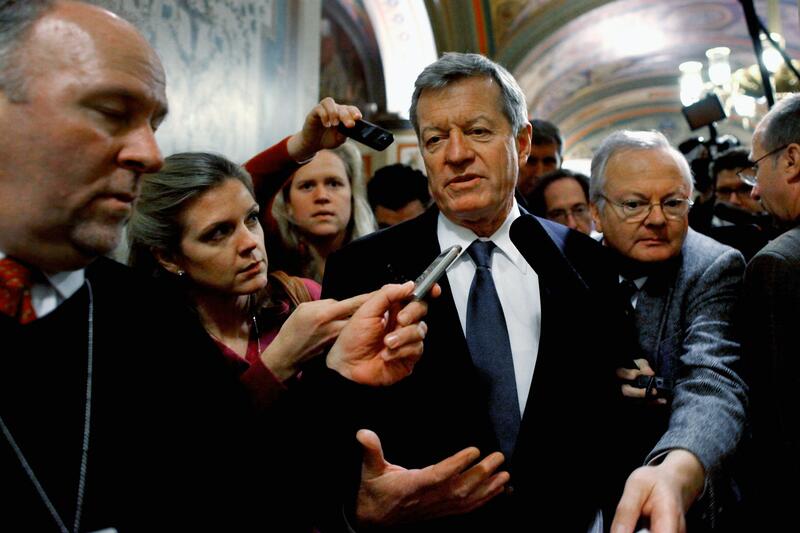 Sen. Max Baucus after a meeting of the Supercommittee. Much has been made of the depth of the economic crisis facing the United States, and it should not be underestimated. But only about 30 percent of the trouble facing the U.S. today is economic – the U.S. economy, compared with all the other developed economies, is in the best structural and demographic shape to weather this storm and ultimately regain its health. But a cancer does exist: The real problem America faces is political, and once again today, it is on stark display. The warring tribes of Capitol Hill rolled out their carefully prepared talking points over the weekend looking to ensure the other side got the blame for the failure of the congressional super committee on Monday. “The President was AWOL,” cried the GOP, “the Republicans sold their soul to the anti-tax lobby,” counter the Dems. The result: an American economic crisis that is eminently solvable has been trusted to the hands of political hacks representing fringe minority factions within each political parties whose primary incentive is to avoid providing ammunition to the other side. Thus has our political system turned a simple question of accounting into an economic version of the Arab-Israeli conflict – a conflict for which the solution has been clear for 40 years if only either side were willing to deal with reality. The 2006 midterm, which brought the Democrats to power in the House and Senate, drew almost exactly the same rate – 40.4 percent. (In Obama’s 2008 election, by comparison, Americans turned out in “record-setting” turnout amounted to 61.6 percent). For a nation constantly bragging about the blood spilled to secure our liberties, this rate of participation is a pretty clear slap in the face to those who did the fighting. The tendency of midterm elections to produce a factions that don’t reflect mainstream opinions – empowered ignorance, if you will – only deepened the fatal flaw in the the “super committee” concept. Always a cop-out on the part of a Congress completely stymied by obstructive radicals on the right, the decision to empower politicians – of all professions – with the power to make the decisions necessary to put the U.S. on a sustainable growth path was laughable. In what parallel universe would the tenants of an apartment building faced with a crisis – let’s say, an electrical system that keeps causing small fires – choose to solve it by appointing a panel of tenants with no expertise in electrical matters? Call me crazy, but I would call an electrician. So where do we go from here? The first step is to take a page from Europe. When the Greek and then the Italian economies reached the economic precipice earlier this month – the ultimate destination of the American economy if our political paralysis – the radical solution was to cut the politicians out of the picture. In both countries, governments of technocratic experts – each, importantly, led by an economist – were formed in a last ditch effort to wrest the national steering wheel from self-interested, politicians who would be second-rate lawyers if they hadn’t figured out a way to live quite well on your tax revenues. Such a solution is more difficult in a presidential system – but not impossible. A real super-committee – a real committee not only empowered to take the steps necessary to right the American economy, but competent to do so – would include 12 serious thinkers. They might include policymakers like former Fed Chairmen Paul Volker or (the suitably contrite) Alan Greenspan, economists of left and right like Stanford’s John B. Taylor, Yale’s Robert Schiller, NYU-Stern’s Nouriel Roubini, plus a few representatives of labor, small business and capital – let’s say Robert Reich, Joseph Schneider of Lacrosse Footwear, and Warren Buffett, just for kicks. No investment bank chairman, please, and no one facing reelection. In the longer-term, the job belongs to the American electorate. Wake up folks – only American voters can punish the shortsightedness of the recent policy debates and force a reasoned conversation about the country’s future. The world must hope the actual electorate – the one that consistently tells pollsters that they understand that both tax hikes and spending cuts need to be part of the solution – will show up at the polls. Reforms to the primary system, abolishing the archaic electoral college, fixing the redistricting process and instituting more reliable balloting and vote counting procedures all make sense, as do changes in the way Congress apportions its power internally. But by not showing up at midterm elections, Americans deliver their franchise to whatever fringe happens to be most aggrieved in that particular cycle. In an impassioned and insightful essay in National Journal last summer, Mickey Edwards, a former congressman from Oklahoma, laid out a six-point plan to “Turn Republicans and Democrats into Americans.” His recommendations focus on process, mostly congressional, that, like U.S. midterm elections, tend to give vocal minorities a veto on decision making. But no reform is big enough to overcome apathy, and the fact that a majority of Americans take their most important right for granted cripples American democracy and throws opens the door to activist factions. For that to happen, Americans have to care enough to put down the television remote and vote. * There are other ways to measure voter turnout – and almost all of them make the problem look worse. Using an alternative method – measuring the percentage of the voting age population – the 2006 and 2010 turnout is even more abysmal: 37.1 and 37.1 respectively.